Anna’s Secret Legacy by S.A Williams See the secret room for more answers on the molecular discovery that could revolutionize medicine! Even well after Watson and Crick discovered the double helix form of DNA in the mid 50’s, the link between protein and DNA was unknown. At the time of my researchers in the story no one would have known this connection. However, it came to be known that a cell’s DNA holds the code that the body uses to make proteins. As such, novel lifeforms, with different DNA than ours (or other DNA currently known) can create, as part of their ongoing life functions, novel proteins with new, previously unknown functions. The reason that large pharmaceutical companies spend so much time and effort exploring unknown areas of the earth is to find lifeforms who have adapted in one way or another to use novel molecules which might hold biological function in humans. It is reasonable to think that in a hot spring, in an isolated area in Russia, there exists for reasons of heat, pressure, and chemical composition of the earth’s crust in the locale, an environment for a bacteria to have evolved in a manner completely differently than any other life form. These bacteria would certainly live in a hostile environment, and may have evolved sophisticated methods of self repair in order to safe-guard its cells from the extremes in which it lives. The bacteria would certainly, over time, lose some of this protein to the water around it, and when the bacteria die their membranes would rupture spilling both this protein (and everything else they make) into the water around them. It’s very plausible to think that if these protein chains were contacted and injested by humans, their DNA repair functions might work, curing illnesses and preventing other diseases from taking hold within the cell. As an example, cancer kills by mutating DNA; a protein which could repair DNA with precision would likely cure every known form of cancer. Such bacteria-produced proteins could be a ‘cure all’ for diseased or damaged cells. Any molecule which corrects DNA abnormalities must associate itself in the cell with the DNA strand. Therefore, it could be easily tailored to cause cell death through simple variations of the DNA structure. This entry was posted in Amazon, Anna's Secret Legacy, Anna's Secret Legacy Blog, Annas secret legacy novel, Avalon, Banks, Barnes & Noble, Book Blog, Book Signing, Borders, Chapter 5 Excerpt, Gold, Love Affair, Pilots, Saratoga, Scientific Discovery, spies, Travel, World War II. Bookmark the permalink. 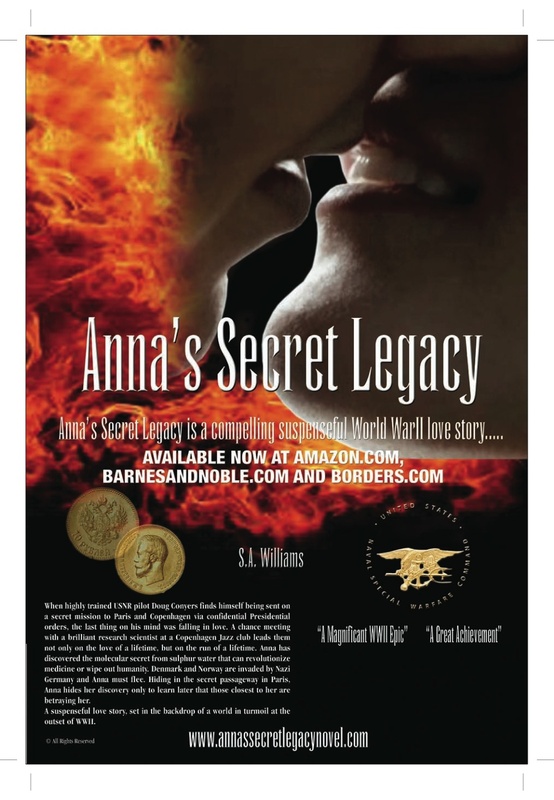 ← Anna’s Secret Legacy- A WWII love story, mystery and psychological thriller-a must read! Available online!